What you see here is a screenshot from a short embedded tutorial that demonstrates the depths to which the different wavelengths of light penetrate the skin. It is a part of L’Oreal’s Skin Science page, a very extensive resource that will help you learn much about your skin and the science L’Oreal does for R&D of their products. To view this tutorial, you will need to go to this page and click on the image. A pop-up will appear that will slowly demonstrate wavelength penetrating the skin. Helpful information to keep your skin safe and young looking for years to come. 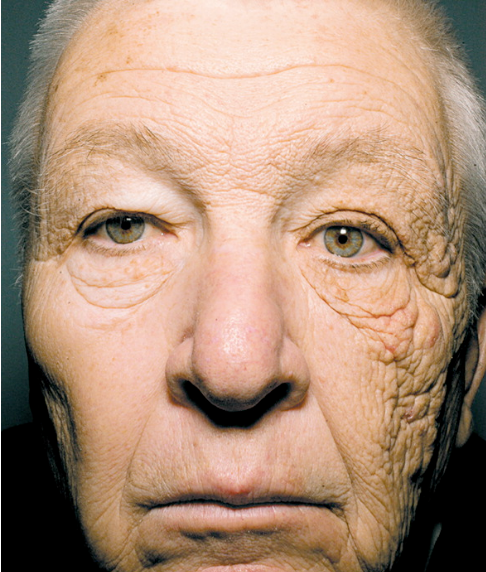 Just take it from this trucker in this now well-known image of what the doctors called ‘Unilateral Dermatoheliosis” (one-sided sun-damaged skin) from The New England Journal of Medicine. Below, you can watch a video (in French, turn on subtitles) of one of the L’Oreal scientists who researches the mechanisms by which skin can be damaged by the sun in order to create products that either protect the skin or can help repair damage once it has happened. Interestingly, their work is also helping ‘Children of the Night’, those children who have the autosomal recessive disorder, Xeroderma pigmentosa, where the skin is extremely sensitive to sunlight because the DNA is unable to repair itself after exposure to UV light. At this time, I haven’t looked into how the two molecules/products mentioned in the video work or if they are included in any products, but hopefully their work is rigorous and the science sound. My name is Françoise Bernerd. I’m a photobiologist and I study the impact of ultraviolet rays on the skin, here in L’Oreal’s biological Advanced research department. The sun emits many different types of radiation. One of these is ultraviolet – or UV – radiation. Most people are aware of UVB. These are the high energy rays that are responsible for sunburn. For many years it was believed that UV A, which is not responsible for sunburn, didn’t have any harmful effects, other than tanning or affecting skin pigmentation. And then, in the 90s, it was discovered that this type of radiation was not at all harmless, and that while UV A rays did not produce any obvious changes, they had very harmful long-term effects for the skin. We use experimental systems that allow us to reproduce sunlight in the laboratory. We use these systems to expose reconstructed skin to UV radiation. This reconstructed skin is grown here in the laboratory. It has a three-dimensional structure, which means it is actually skin tissue, rather than just a skin culture in a test tube dish. This reconstructed tissue allows us to see how different wavelengths of UVB and UVA will impact, depending on the amount of pigmentation in the skin. Through this process we were able to identify and demonstrate the efficiency of a molecula such as Mexoryl SX, which is an extremely powerful UVA filter. This process will allow us to identify balanced filtering systems to cover the entire solar spectrum. The second approach is to find ways of repairing the damage – such as photo ageing – that harmful radiation can cause on skin through long-term exposure. We have identified molecules that are capable of repairing this damage, such as Pro-Xylane. Bringing these two approaches together means we can offer a combined preventive and corrective approach. L’Oreal is also well known for their support of women in science along with UNESCO. Check out their website to learn more.